Rupert Whitaker began his love affair with food aged nine when he cooked his first veal with red wine and mushroom sauce. 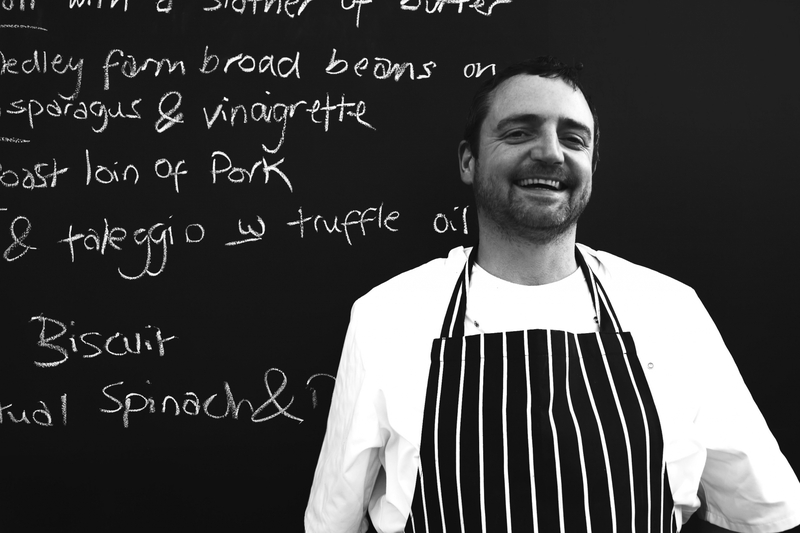 Spurred on by his mum’s great home cooking (her bread and desserts often appear on the The Field Kitchen Oxford's menu), Rupert began his chef training in Paris at 'Willis Wine Bar'. It was here he learned the art of a good stock and fine French cuisine. Rupert went on to set up restaurants as a professional consultant and opened some of Oxford’s leading independent restaurants. 'The Lemon Tree', 'Coco’s', 'KazBar'; even appearing on channel 4 when he opened 'The White Horse' in Stonesfield. He flirted with having his own place for a few years but decided to take a break from restauranting and pursue his other passion for the film industry. In the last 6 years Rupert has produced two independent feature films and worked on several international documentaries. He kept his hand in whilst filmmaking to run an intimate cooking course called 'Plate' which he took to people’s homes one evening a week. Rupert also worked with a young people’s charity 'Parasol' teaching disabled and non-disabled young adults how to cook for themselves. It was on his latest feature film that Rupert acquired the The Field Kitchen Oxford van. His plan to save money on the budget – was to buy in a catering van and hire a local chef to feed his crew three meals a day for 25% of the cost of outsourcing to a professional catering company. This worked very successfully; Rupert hired Michael Maguire (head chef of Branca) and the crew lived for their lunch break. Once the film had wrapped Rupert saw an opportunity. To be able to reach out as a chef again without the restrictions of owning a restaurant and entirely on his own terms. Thus The Field Kitchen Oxford was born. Rupert now runs The Field Kitchen Oxford as well as producing movies and hugely enjoys his dual but equally creative and challenging lifestyle! Rupert has catered privately in people’s homes under The Field Kitchen Oxford’s banner over the last 4 months since opening and is available to be booked for small dinner parties. He cooks up a three course meal with aperitifs to The Field Kitchen's style, even with it’s own mismatched vintage crockery if desired. To enquire about Rupert cooking in your home please call on 07854 809 479.